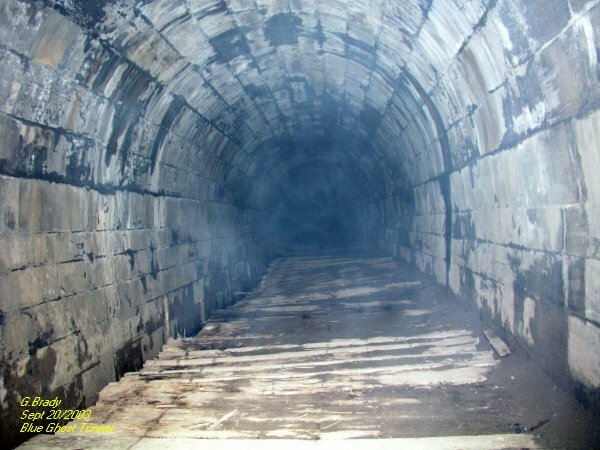 On the right side of the tunnel you can see some faint ecto mist near the top of the tunnel. At the time Paul and Matt were getting a little nervous and wanted to leave. In this photo Matt and Paul had left the tunnel. You can see them at the end just barely at the entrance. 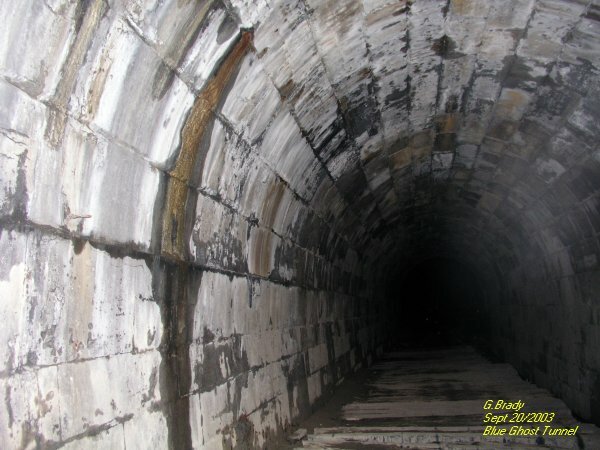 The energy form that seems the longest appears to be that of an arm almost reaching for the two at the end of the tunnel. There was a low pitch growl at the time this photo was taken. 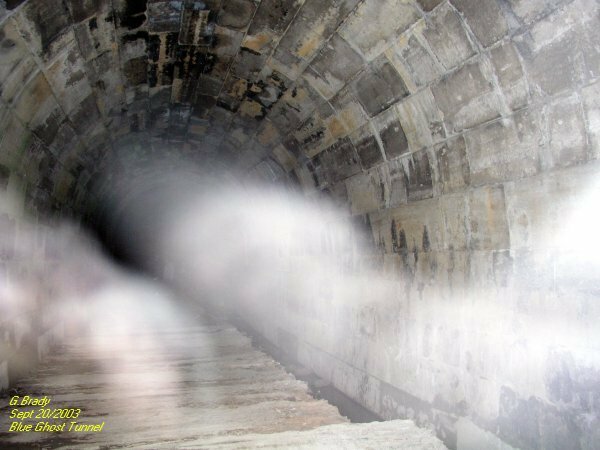 I had moved forward towards the front of the tunnel and turned around to see if anything was following me and caught some ecto plasm forming where I had just been. Something was starting to form in the middle of the tunnel. Cathy had taken this picture. 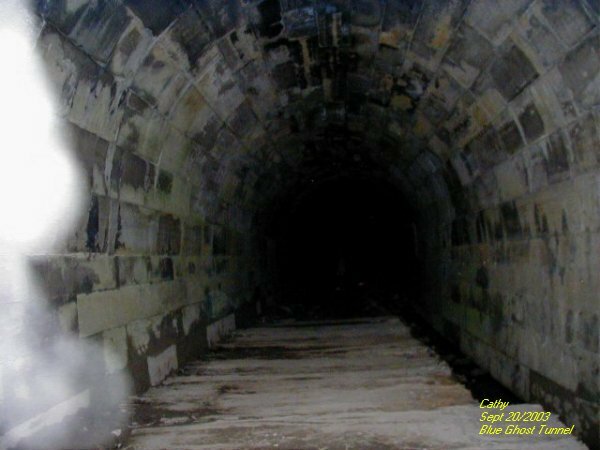 It was getting late and she was almost out of the tunnel and took this shot for she had felt that I was being followed by a spirit. 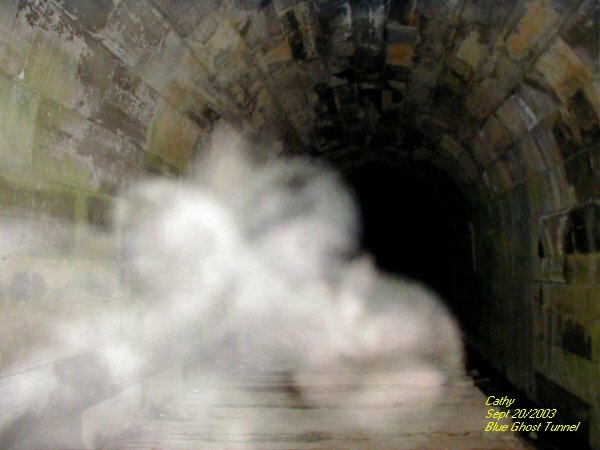 In the photo there was a spirit form right beside her in the tunnel. Cathy had taken another picture and got this form of what appears as a woman with puffy sleeves crossing her arms. One can make out a face of a woman just above the arms. Once we were all together outside Cathy took a picture by the entrance to the right side of the tunnel. Paul had asked her to take a picture by the trees for he and Matt said that something was shaking the trees prior to her coming out of the tunnel. 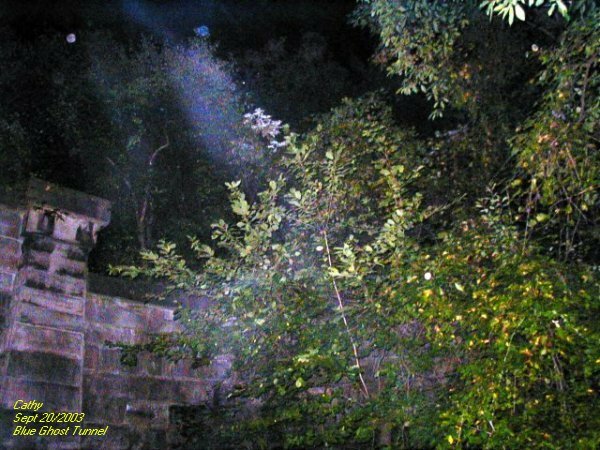 In the photo it shows a blue energy form hovering above the trees by the entrance.